I just can’t imagine Czech Christmas, New Year’s Eve, Easter or Name Day without potato salad. Absolutely unimaginable. (Yes, Europeans celebrate Name Day and my "svátek" is on April 27th.) The salad is eaten as is, on open sandwiches (Chlebicky) as a spread, with schnitzel or with breaded and fried carp (traditional Christmas Eve dinner). Finely chopped potato salad is also stuffed into halves of tomatoes and eggs. Czech potato salad is truly symphony of textures and tastes. You have soft potatoes and peas, crunchy celery, pickles and onions and carrots and celeriac somewhere in between. Then you have sweet (carrots, peas, celeriac), sour (pickles) and acidic (mustard, onions). What a treat, it’s just too bad that it is so labor intensive. There is a lot of chopping involved and food processor would just make royal mess of all the food. Cook unpeeled potatoes in unsalted water. Cook the carrots, celery root and parsley root until al dente, do not over cook. When done, peel the potatoes and chop. When rest of root vegetables are cool dice them and put them in large mixing bowl. 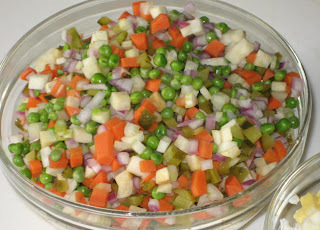 Add chopped celery stalks, onions, peas and pickles. Finally, add boiled eggs finely cut or pressed through the slicer. Add salt, pepper, mustard and mayonnaise, taste and adjust seasoning if needed. · I cook my potatoes in microwave oven, it has a program for potatoes, but I remove them before program ends, otherwise they would be too soft. · I also cook my root veggies in microwave with just a tablespoon of water. · To remove acidity and harshness from raw onions I chop them, put them in colander and blanch them by pouring boiling water over them and then plunge them in cold water, let them sit in water for about 15 minutes, then drain and dry them before mixing them with rest of vegetables. It works great! · Don’t even think of using frozen carrots and other frozen vegetables except peas. Since you can’t buy fresh peas the frozen ones have better texture then can ones. Frozen veggies have no texture and are totally void of taste. It is an awful mush. Try to chop all veggies into same size. Potato salad chopped to spread like consistency and used on open sandwiches (Chlebicky) and halved tomato.